WANT TO CREATE YOUR OWN COLOR CERAMIC TILE COASTER SET WITH YOUR GRAPHICS, TEXT AND CHOICE OF COLOR? EMAIL US THRU THIS LISTING, AND ASK US HOW! Our store, Trinkets-n-Treasures, is located at 709 10th Street, in Greeley, Colorado. If you want to purchase and pick up your custom laser etched color tile coasters from us locally, you may do so. If you have any questions about a local purchase and pickup, feel free to contact us thru this post. We will work with you from there. Our store hours are every Saturday from 9:00am thru 5:00pm, and every Sunday from 10:00am thru 5:00pm. We currently have 39 vendors with booths inside our Greeley, Colorado store, combining for a STORE FULL of shopping options for those who enjoy craft show shopping. We offer custom laser etching on ceramic colored tiles that we craft into very nice drink coasters. Our laser is a 100-watt system that will burn into (and sometimes thru) glass, ceramic, wood, leather, and a few other common materials. Our machine cannot carve INTO metal objects, but we add colors to metal, and then laser burn thru those colors, and down to the silver of the metal. These are standard 4-inch square ceramic floor tiles that we add 2-3 layers of color to. We then laser engrave the graphics and text thru the color layers, and into the ceramic tile surface. We then finish them off by adding a thick layer of polyurethane to help provide another layer of protection to each color laser etched tile coaster. They are made to withstand years of normal use. NOTE: If these ceramic drink coasters are abused in various ways, they will be subject to chipping, cracking breaking, etc. If they are used as normal coasters usually are, you'll be fine with these unique coasters for many years to come. 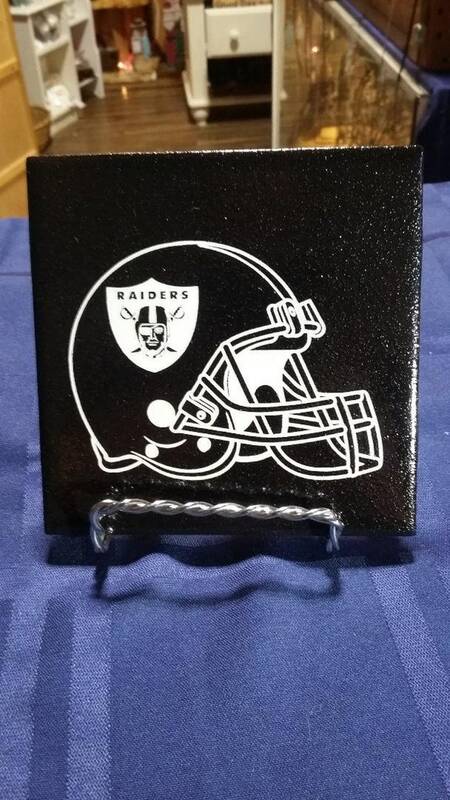 This particular 4-pack of color laser engraved ceramic coaster option depicts the Raiders logo on the side view of a football helmet, with the team name, "RAIDERS" centered under it. This set is sure to start some fun conversations, whether you really use them with friends for your favorite adult beverage, or if you simply display it where it can easily be spotted by friends, family, etc. We will ship your stock or custom laser engraved color ceramic tile 4-packs within anywhere from 2 to 4 days, depending on the time of year, and the size of your order. We strive to ship at least twice per week, every week. All in-country customers who purchase two or more laser engraved color ceramic tile coaster sets will receive a FREE upgrade to their shipping to the swifter "Priority Mail" option. That usually saves between 1 and 3 days on the in-transit time your package takes to arrive. This upgrade is given to you automatically, when you purchase two or more tile sets from our Etsy store, and have them shipped to the same address, at the same time. You may combine purchases from our Etsy store in order to receive this shipping upgrade FREE OF CHARGE. You also do NOT have to stay with the color choice shown. You can request your color laser engraved ceramic tile coasters be made in any of the colors we currently offer. In fact, if you need more than one tile sets, you can order them all through this listing, and then just let us know the colors you want them each made in. Thanks again for shopping here in our Etsy store, and we look VERY forward to helping create just the right tile set(s) order for you.